Were Hedge Funds Right About Souring On Vornado Realty Trust (VNO)? We know that hedge funds generate strong, risk-adjusted returns over the long run, therefore imitating the picks that they are collectively bullish on can be a profitable strategy for retail investors. With billions of dollars in assets, smart money investors have to conduct complex analyses, spend many resources and use tools that are not always available for the general crowd. This doesn’t mean that they don’t have occasional colossal losses; they do (like Peltz’s recent General Electric losses). However, it is still a good idea to keep an eye on hedge fund activity. With this in mind, as the current round of 13F filings has just ended, let’s examine the smart money sentiment towards Vornado Realty Trust (NYSE:VNO). Is Vornado Realty Trust (NYSE:VNO) the right investment to pursue these days? Money managers are taking a bearish view. The number of long hedge fund bets were cut by 2 lately. Our calculations also showed that VNO isn’t among the 30 most popular stocks among hedge funds. Let’s take a look at the recent hedge fund action surrounding Vornado Realty Trust (NYSE:VNO). How are hedge funds trading Vornado Realty Trust (NYSE:VNO)? At the end of the fourth quarter, a total of 23 of the hedge funds tracked by Insider Monkey held long positions in this stock, a change of -8% from one quarter earlier. 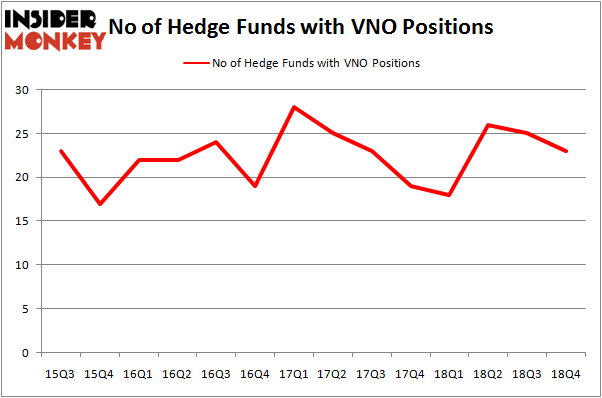 The graph below displays the number of hedge funds with bullish position in VNO over the last 14 quarters. With the smart money’s capital changing hands, there exists a few notable hedge fund managers who were boosting their stakes meaningfully (or already accumulated large positions). According to publicly available hedge fund and institutional investor holdings data compiled by Insider Monkey, Long Pond Capital, managed by John Khoury, holds the number one position in Vornado Realty Trust (NYSE:VNO). Long Pond Capital has a $148.2 million position in the stock, comprising 5.8% of its 13F portfolio. The second largest stake is held by Martin Whitman of Third Avenue Management, with a $49.8 million position; the fund has 4% of its 13F portfolio invested in the stock. Other hedge funds and institutional investors with similar optimism encompass Dmitry Balyasny’s Balyasny Asset Management, Jeffrey Furber’s AEW Capital Management and David Harding’s Winton Capital Management. Since Vornado Realty Trust (NYSE:VNO) has witnessed declining sentiment from the entirety of the hedge funds we track, it’s easy to see that there was a specific group of hedgies that elected to cut their entire stakes heading into Q3. 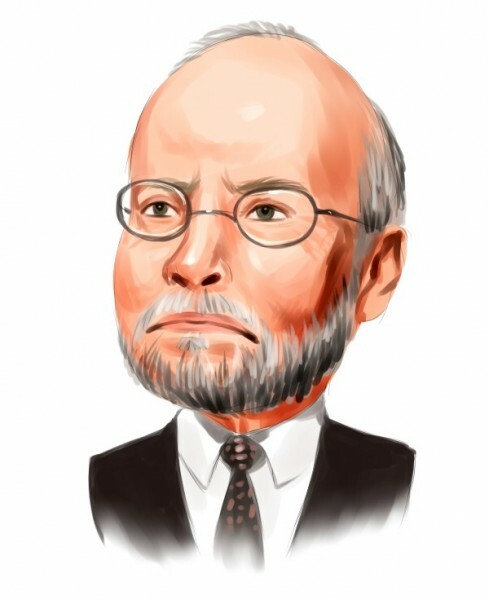 At the top of the heap, Jim Simons’s Renaissance Technologies dumped the largest stake of all the hedgies tracked by Insider Monkey, totaling an estimated $14.3 million in stock. Glenn Russell Dubin’s fund, Highbridge Capital Management, also sold off its stock, about $10.9 million worth. These bearish behaviors are important to note, as total hedge fund interest dropped by 2 funds heading into Q3. Let’s now take a look at hedge fund activity in other stocks similar to Vornado Realty Trust (NYSE:VNO). These stocks are Expeditors International of Washington, Inc. (NASDAQ:EXPD), Take-Two Interactive Software, Inc. (NASDAQ:TTWO), Telecom Italia S.p.A. (NYSE:TI), and DISH Network Corp. (NASDAQ:DISH). This group of stocks’ market caps are similar to VNO’s market cap. As you can see these stocks had an average of 30.5 hedge funds with bullish positions and the average amount invested in these stocks was $902 million. That figure was $337 million in VNO’s case. Take-Two Interactive Software, Inc. (NASDAQ:TTWO) is the most popular stock in this table. On the other hand Telecom Italia S.p.A. (NYSE:TI) is the least popular one with only 3 bullish hedge fund positions. Vornado Realty Trust (NYSE:VNO) is not the least popular stock in this group but hedge fund interest is still below average. This is a slightly negative signal and we’d rather spend our time researching stocks that hedge funds are piling on. Our calculations showed that top 15 most popular stocks among hedge funds returned 19.7% through March 15th and outperformed the S&P 500 ETF (SPY) by 6.6 percentage points. Unfortunately VNO wasn’t in this group. Hedge funds that bet on VNO were disappointed as the stock returned 9.6% and underperformed the market. If you are interested in investing in large cap stocks, you should check out the top 15 hedge fund stocks as 13 of these outperformed the market.